Outdoor Wedding Ceremonies Are A Must! 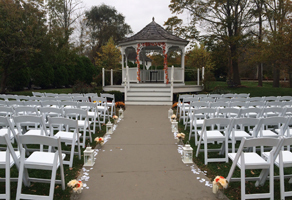 Outdoor wedding ceremonies are a must in New England, it is one of the few places that you can experience all the seasons throughout the course of 12 months. But throwing an outdoor wedding can be tricky no matter what the season is so here are a few tips on throwing the perfect outdoor wedding! 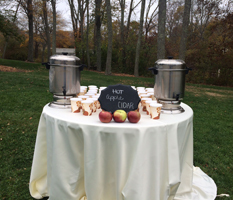 Use nature – The best part of getting married outdoors in the natural beauty of nature. Tie in the seasonal nature with the décor, whether it be the changing leaves in the fall or the bright greens and blues of the summer, work with the nature around you to make your ceremony beautiful. Don’t just stop at décor, tie in the nature of the seasons with the food as well. Use fresh veggies or create a delicious specialty cocktail with the flavors of the season. Inform Guests Beforehand- Make sure you inform your guest beforehand so they can come prepared. A small note on the wedding invitation will go a long way to your guests. Heels are often a big problem when it comes to outdoor weddings, if you’re getting married in a grassy outdoor space warn your female guest to not wear their sky high heels, or even better now you can purchase heel protectors that prevent heels from sinking into the grass. Decorate- Although nature is often the most beautiful décor, make sure to incorporate flowers and lighting to give your outdoor wedding ceremony a beautiful touch. Lighting is a great thing to take advantage in an outdoor wedding. Get creative and add a touch of romantic ambiance to an outdoor wedding. Align your aisle with fresh (or faux!) rose petals and light your way as you walk down to say “I Do” with candles and lanterns!